Two years ago, in the summer of 2014, Brian Curran, a Professor of Art History at Penn State, finally received an explanation for the variety of physical symptoms he had been experiencing. Doctors at Johns Hopkins University delivered the difficult news that Brian was suffering from ALS (amyotrophic lateral sclerosis). Since his diagnosis, Brian has drawn on his love and passion for his students and work to keep him engaged with undergraduate and graduate teaching, mentoring doctoral students in their research, staying on top of his research field, and leading health care reform campaigns at Penn State. Brian and his wife, Mary (who also works at Penn State), are treasured and adored by their family and their ever-expanding group of friends and colleagues from around the world. 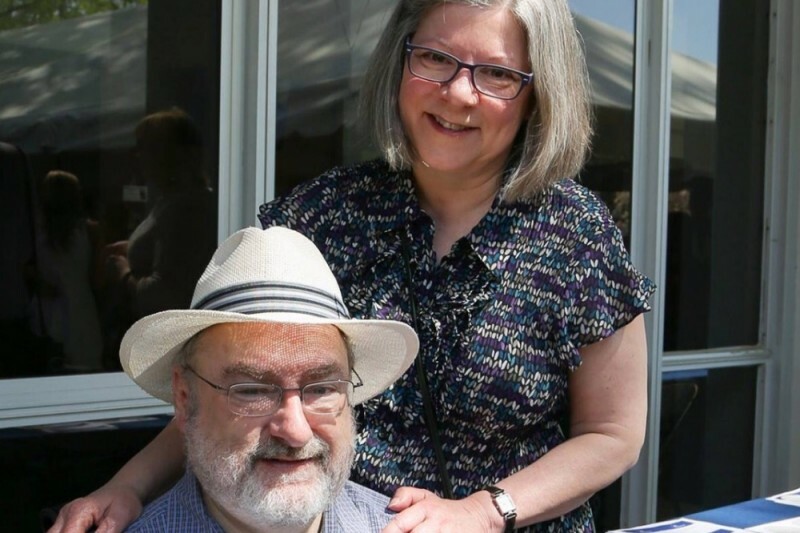 Despite his commitment to slowing the progression of his disease through regular physical therapy and medical appointments, Brian's health has continued to decline to the point where he and Mary need to make difficult financial decisions regarding his care. Although well-insured, the out-of-pocket expenses associated with Brian's care as his illness progresses are staggering. This Gofundme campaign will raise funds to give Brian and Mary the additional resources they need to make Brian comfortable, able to live in his home and get to medical appointments in the coming months, including a custom-made wheelchair, a used minivan customized for his wheelchair, and small renovations to their home to accommodate Brian's mobility challenges. The funds also will help support Mary as she spends increasing amounts of time tending to Brian, including grocery and meal delivery services and assistants to help bring Brian to appointments or care for him at home. Anyone whose life has been touched by the Currans know that Brain and Mary truly are some of the most giving, kind, and generous people they've met. Brian and Mary have friends around the globe and never hesitate to help others in need. Giving back to them during this difficult time would honor the countless ways they have supported others throughout their lives. Every little bit helps.....thank you for giving what you can. HELP SPREAD THE WORD! Hello GoFundMe Community for Brian Curran! As spring arrives and the academic years draws to a close, I am sending an update for the Currans. First and foremost, Brian and Mary continue to be amazed and inspired by your friendship, support and reaching out to help during this incredibly difficult time in their lives. They truly are grateful for all you are doing for them. Brian's health has significantly declined over the course of the semester and he is mostly confined to his chair. Fortunately, the medical interventions he has gotten in the past few months have offered him better sleep and more comfort, including the feeding tube, cough assist and breathing equipment, as well as other interventions. Brian and Mary have been getting better rest which has been very welcomed. Your donations have given them the financial support they need as their life insurance benefits slowly kicked in, and in between financial reimbursements for various health-related expenses which have started to grow along with Brian's medical needs. The next big financial cost for the Currans is a custom wheelchair that will take 6-8 months to manufacture. Some of the costs are covered by various insurance benefits, but a fair amount is not covered. This chair, to the tune of $30,000+ will be Brian's living space, allowing him to receive the medical interventions he needs while also remaining comfortable (e.g., holding up his head as his neck muscles have become weak). In addition, Brian is requiring more home health care and medical treatments in the home. Your donations help cover these expenses too. Your donations have taken much strain off of Mary as she continues to juggling the medical bills and unexpected costs. For example, Brian had an unexpected ambulance ride to the ER last month -- insurance did not think the ambulance was medically necessary (!) even though he was bleeding, thus the bill became theirs to cover 100%. Thanks to this gofundme nest egg, Mary was able to pay the bill in full without too much distress. Thus, this gofundme account helps reduce the stress whenever the unexpected costs come in. THANK YOU! Thank you so much for your contributions which have been an enormous help during this very challenging time. I ask that you help get the word out to others to help enlist their support in whatever ways they can help. As always, please know that Mary and Brian send their deepest gratitude for all the ways your support, care and offer them. Dear Family and Friends of Brian. It has been a few months since my last update. In that short period of time, Brian's health has continued to decline, perhaps more rapidly than before. He is receiving good care at home with different medical personnel coming in to assist. Of course, he continues to pursue his passion for teaching and supporting his graduate students, colleagues, and profession. His passion and dedication are an inspiration beyond words. As part of his journey, Brian had a feeding tube inserted at the Johns Hopkins ALS clinic yesterday. He is receiving outstanding care and we hope he will be home later today. This procedure will give him the nourishment he needs and hopefully more energy. Brian and Mary are indebted to their family and friends for your support in all the ways you having been giving...kind words, visits, phone calls, and donations toward his medical expenses if r when possible. They THANK YOU for all you are doing to support them during this difficult time in their lives. Thank you everyone for all the generous support! Mary learned late last week that she has at least another 4 weeks of no walking or using her leg. The great news is that so many people in our community have stepped in to help take Brain to campus to teach his class, provide regular tasty meals, and help out around the house. Brian now is having physical therapy at home, which is a welcomed change from the challenges of going to the therapy center a couple of times a week. This campaign is giving them the financial support needed to get through the insurance gap. It is a nightmare trying to navigate the complexities of long-term disability insurance, health insurance, and when medicare can finally step in. It is a sobering reminder of how financially vulnerable we are when health crises kick in, even when we are well insured. With this campaign, in addition to the ramp installation, Mary is arranging the purchase of a walk-in temporary shower for Brain on the first floor. Mary and Brain are deeply touched by the outpouring of support to help them through this difficult transition. Thank you -- every little bit helps!! Hi Everyone! WOW! What a great kick off to this campaign to support Brian and Mary. The Currans are overwhelmed by the support they've received and deeply thank each of you for being so generous. The ramp for Brian has been purchased and is set to be installed next week, much to his and Mary's delight. Your support has made such a difference in their lives. THANK YOU! And thanks to the many good friends and esteemed colleagues who have so generously contributed to Laura Klein North's gracious efforts to raise some funds to help us in this very challenging time. We are truly humbled by the response which has made it much easier to face the unforeseen and uncovered costs of this pernicious disease. There are too many to name individually here who have made the difference and allowed us to at least try to conduct what we can of a so-called "normal" life. Your generosity leaves me speechless. Mary and I are extremely grateful for your friendship and help. It helps knowing that we're not going through this battle with ALS alone. Wish I could treat you to a lovely meal in Rome instead of doing this. Such a small way to thank you for all you have done for me and so many others. Even for those of us who've only met Brian through email, it's hard to quantify the positive difference he continues to make.